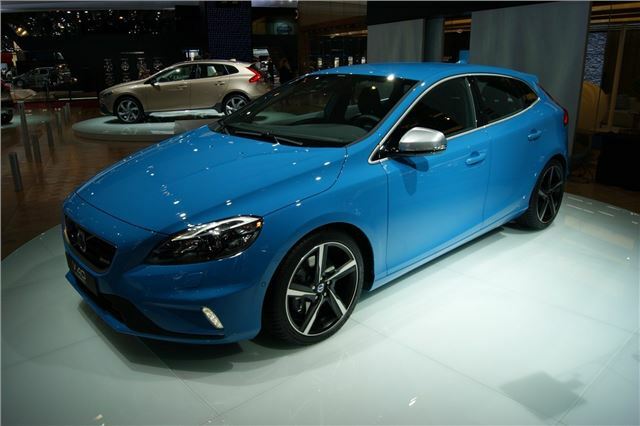 Volvo has premiered the V40 R-Design at the Paris Motor Show. R-Design is Volvo’s sportier trim level and features a more aggressive grille and front bumper design, LED running lights, ‘silk-metal’ details, twin exhausts and five-spoke alloy wheels. In the cabin there are details like R-Design embossed leather or ‘T-Tec’ upholstery and a TFT instrument cluster, as seen on other V40s, but with a unique colour scheme. Buyers who want more equipment can choose R-Design LUX, which includes full leather, xenon lights, rain sensor, cruise control and keyless start. The full range of V40 engines is offered, including the high-performance 254PS T5 petrol for enthusiastic drivers and the D2 diesel, with its low emissions of 94g/km, for the more frugal buyer. As an option Volvo will fit a sports chassis, which lowers the suspension, stiffens up the springs and shocks and adds stiffer anti-roll bars with revised front MacPherson struts. Prices are yet to be announced but R-Design models will likely be around the same price as SE Lux trim, which starts at £22,740 on the road. Order books open in October.